This month he learned how to walk! He's still not super sure he wants to, and crawling is so much more efficient anyway! But he will take a few steps without anyone coaxing him and he'll take more than a few if you are trying to get him to come to you. He's also getting a new tooth. It's a molar and I think causing him some pain so he's been chewing on anything he can get in his mouth and drooling buckets. It's pretty funny to see his little Piglet or Pooh figurines with their head stuck in his mouth! He can also wave, but I can't remember if that's new this month or last. Sometimes he will do it "on command", but more often than not it's after we've left the building! 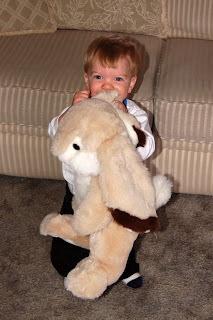 I like my bunny, Mom! Check it out, I'm a lot bigger than he is now! 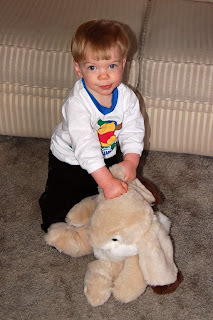 Two questions: I'm debating continuing the bunny pictures every month because they don't show as much difference now. I'm wondering if I should go to every other month or just drop it all together. Opinions? Please leave a comment! Also, if you're so inclined, the voting is open in this photo contest with my picture from yesterday. Voting is only open until midnight tonight so go and vote for me! Or vote for someone else if you wish! I'm pretty far down the bottom of the poll so you'll have to scroll down in the little window. Krista your little boy is sure cute! It's so fun when they take their first steps and it seems like they are off and running around so quickly after that. I haven't been online for a few days so I caught up on all your posts. It is always fun to have comparative pictures as the children grow ... At this age they don't grow as fast as when they were first born so there probably wouldn't be a noticeable difference every month. If it were me I'd go every 2 or 3 months so there would be a bigger difference. It's a cute idea. Don't give up on it! Then when he's two you can go to once a year until he is married, lol. I was going to pretty much say the same thing the previous poster said. Every 6 months or once a year would probably give you better comparison photos now. I wish I would have done something like that with my girls. wow pics every month, I remember that....poor third child- 200 years from now the family will look back and wounder if he even existed or was just the neighbor boy..ha ha ha. looks like your having fun being a mom..keep up the good work, its worth it. Looking back, I now wish I'd done the pictures each month with our son. How fun to go back and look at those later on and see the changes. Seems like if you blink you miss it!! !